These comfortable waterproof protectors are easy to use and have a self-sealing band allowing them to be submerged. 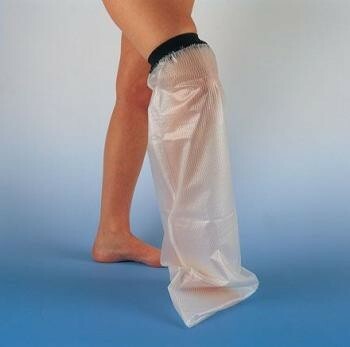 Simply slip over a cast or dressing on either the leg or arm to protect them whilst showering or bathing. The neoprene band has a wide area of contact and therefore does not pinch the skin or feel constrictive. The main body is made from a pliable waterproof PVC/nylon mesh, which is roomy and slip resistant. It also contains an antimicrobial treatment providing protection against bacterial and fungal attack. The protectors are re-usable and will last, on average, eight weeks with normal use. Not suitable for use with open or undressed wounds. Latex free.